M/SGT Clifford Ridgeway Davis, USAF (RET) passed away on December 11th, 2009 from pancreatic cancer. He donated his shell collection to the Grice Marine Laboratory in 2000 for display, enjoyment and study. During his outstanding military career, he served throughout the world, including Okinawa, Vietnam, Japan, Guam, Hawaii, Turkey and several other locations in the Mediterranean. A decorated combat veteran, his assignments included being a combat medic and a member of the U.S. Air Force Underwater Rescue and Recovery Team during the Vietnam War as well as serving in the Special Operations/Delta Force. He collected all of the shells while enjoying one of his many professional responsibilities, Dive Master and underwater photographer for the USAF from 1966 to 1977. Most of the shells in his collection are from the western Pacific, especially Okinawa. 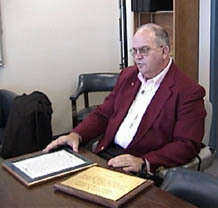 Mr. Davis also served as the Manager of the College of Charleston Motor Pool from 1992 to 1996. 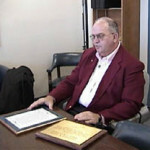 After his retirement, he was an active volunteer in the Charleston community and Veterans Affairs. Grice Marine Laboratory has lost a dear friend and he will be deeply missed. This fall, Dr. Tina Bell joined the Sotka lab as a postdoctoral researcher. Tina received her Ph.D. in September 2009 from the Department of Genetics at the University of Georgia. Her dissertation focused on the population genetics and evolution of feeding behavior in an herbivorous isopod Idotea baltica. Tina will use a newly-funded National Science Foundation grant to generate a phylogeny of herbivorous amphipods in the family Ampithoidae. This phylogeny will help clarify the taxonomic uncertainties within this group of important herbivores and to elucidate constraints on feeding preferences for chemically-rich seaweeds. Tina loves the color ‘rainbow’, she makes a mean pumpkin-chocolate brownie, and is now spending a lot of time with little cups of amphipods. Please welcome Tina when you get a chance. Dr. Kristin Hardy completed her Ph.D. in Marine Biology at the University of North Carolina, Wilmington in 2009. Her dissertation research investigated the effects of diffusion on skeletal muscle metabolism and fiber design in Portunid swimming crabs. Her current research will focus on immunologic and metabolic response to anthropogenically induced environmental stressors in marine oyster, shrimp and crabs. She is an NOAA Oceans and Human Health Postdoctoral Scholar at theHollings Marine Laboratory. As part of her training, she will develop an OHH curriculum directed to Minority Serving Institutes.